As we head toward the weekend a vigorous storm system will roll out of the Southwest United States and into the Panhandle Region of Texas and Oklahoma. This weather maker will likely bring rain, freezing rain, sleet and snow to Oklahoma and will just clip far Southern KAKEland. High amounts of uncertainty plague this forecast at this time. While weather models have consistently picked up on a strong mixed precipitation event rolling across the Southern Plains, the track has been inconsistent. At this time it appears that the majority if not all of the precipitation will fall across Oklahoma with very limited precipitation in KAKEland. Spotty snow and light wintry mix not completely out of the question on Friday across extreme southern Kansas with the most likely areas of seeing precipitation right along the Kansas-Oklahoma State Line. Friday night into Saturday morning, light snow will be possible across Southern KAKEland, mainly between US-54 and the state line. If the weather models that bring the snow into KAKEland, verify, we would see off and on light snow across South Central Kansas through the day Saturday. 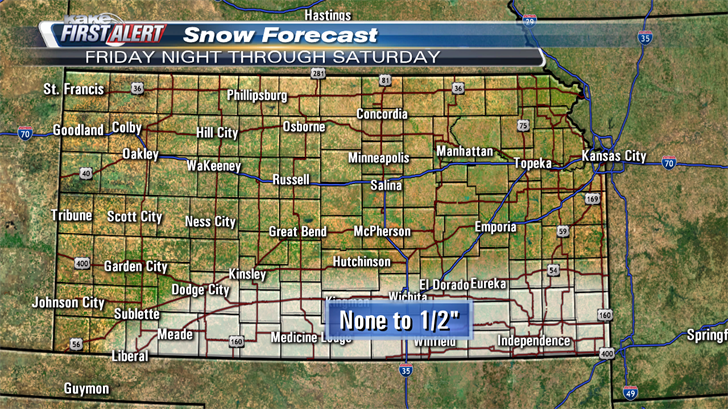 Snow is expected to exit KAKEland late on Saturday. Accumulation of the snow is expected to be minor with much of Southern Kansas seeing less than 1/2” total. Snow totals in and around Wichita will likely be very little through Saturday night with nothing North of US-54. A light wintry mix can’t be ruled out across far Southern Kansas late Friday and even during the day on Saturday. With relatively low snow totals and ample treatment of roads across South Central Kansas, driving conditions are not anticipated to be overly hazardous. As mentioned above, this forecast is shrouded with uncertainty because of the inconsistent track. A subtle move to the south could result in a completely dry forecast for KAKEland Friday and Saturday and the converse is true that a nudge north could produce hazardous driving conditions as more snow would be possible. Please stay tuned for updates and alerts as the system approaches KAKEland.